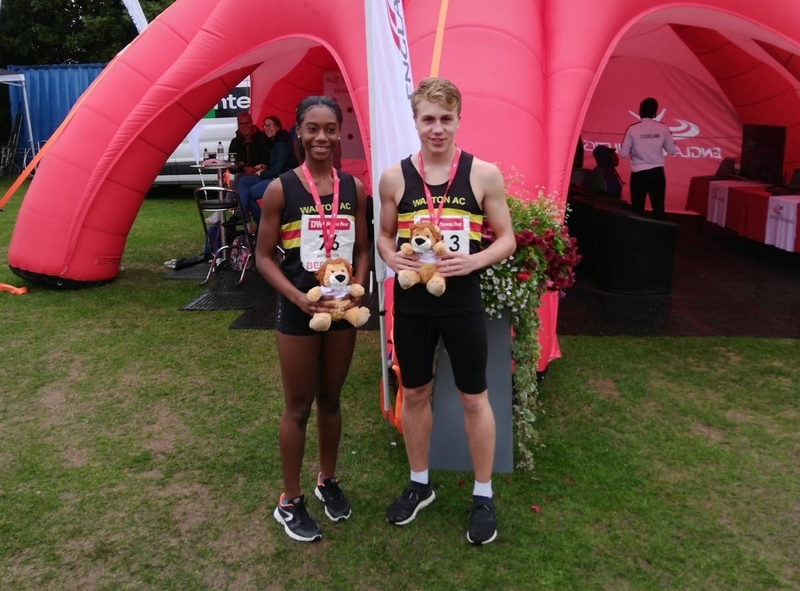 Double success as George Sudderick & Jeslyn Agyei-Kyem take gold in the under 15 Boys & Girls 300 metres at England Age Group Championships in Bedford. I n appalling weather conditions George dominated the race, looking relaxed throughout and with the result never in doubt after the first stride, clocked an impressive 35:84 to successfully defend his title. 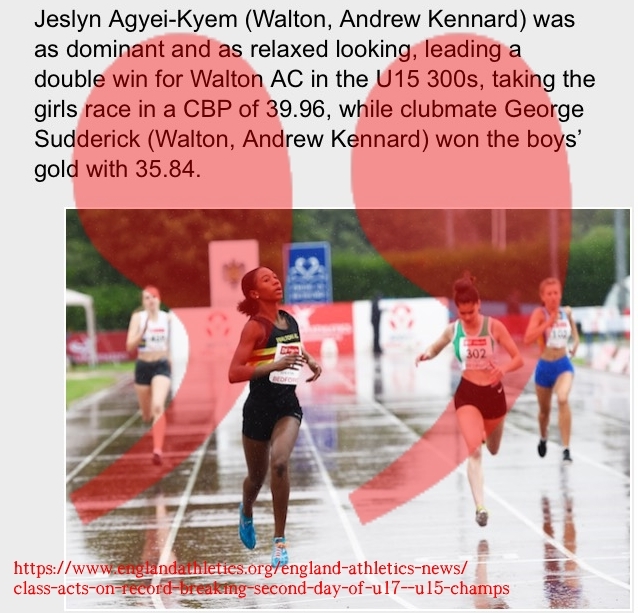 Five minutes later it was the turn of Jeslyn and she did not disappoint either as she stamped her authority on the race from the start and stormed to the under 15 girls title with a new Championship Best Performance of 39:96. Elsewhere on the track Jack Gemmell in his first experience racing at this level did outstanding to qualify for the under 15 Boys final and came home in 12th place running 4:28:60 (4:25:13 in heat). Ross Hirst likewise did amazingly well against high caliber opposition to come home in 15th place in under 15 Boys 3k final (10:05:54). Cedelle Agyei-Kyem was agonisingly close to a medal in the under 17 women’s 300 (40:18) but just missed out in 4th place. In the field Georgia Russell back from four weeks away did herself proud in what has been an amazing season for the Walton thrower, to finish a credible 6th in the under 15 Girls Shot with a throw 10:54 metres. Previous PostFour Walton South of England Champions!Next PostWoking Open and Intercounties Success!